Ambassadors on the Better Learners Better Workers programme (BLBW) showcased the engaging and exciting things the programme offers at the ninth annual Get up to Speed with STEM event. The event took place at Magna Science Adventure Centre on the 27th March 2019 and was attended by over 2000 students. It welcomed over 90 exhibitors, attractions and activities, many local, but others from around the UK. The purpose of the event was to inform, inspire and introduce the next generation to the world of science, engineering and business, all championed by employers and businesses. The exhibits included McLaren, Tesla, The Royal Navy, Mazak Europe and Sheffield Formula Racing, to name a few. Sylvia, Natasha and Hannah, Year 9 students from Sheffield Park Academy, had designed a slideshow presentation to help explain the different things they have been involved in as part of the BLBW programme which they displayed for the visiting students and teachers. This included their trips to Tinsley Bridge and the AESSEAL factory, as well as their engineering summer camp: a four-day project to learn about apprenticeships and engineering opportunities. 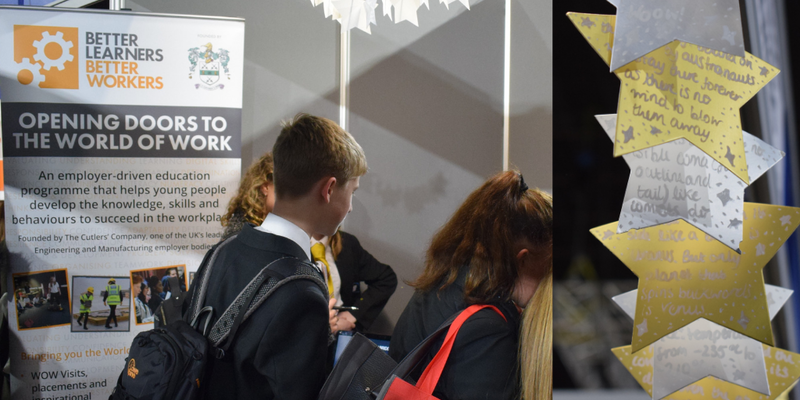 They worked alongside Sheffield Springs Academy, who hosted a quiz tombola on the stall, and created a variety of different pieces to help demonstrate the impact of the BLBW programme and what they have been involved in. These included a model solar system, science fact stars, and an information constellation with photos from previous events. The event was a great opportunity for the girls to talk about the programme and how it has benefitted them and encourage other schools to become involved too.